The regiment is the most senior in the British Army, and it has a long and illustrious history. In 1656 King Charles II, in exile after the execution of his father, raised a regiment from his loyal exiles at Bruges in Flanders. It was called "The Royal Regiment of Guards". On the King's return to his throne in 1660, he disbanded the old Parliamentarian Army and commissioned another regiment of twelve companies for his personal protection. The first of these was called the King's Company. In 1664 the Royal Regiment of Guards was recalled from Flanders and merged with the King's Company to form the "King's Regiment of Foot Guards." By 1665 the Regiment had become the "First Regiment of Foot Guards." The Regiment has fought in almost every major campaign of the British Army since the 1660s. During the 17th Century it served in Morocco and in the naval wars against the Dutch and later played a distinguished role under the Duke of Marlborough, being present at his brilliant victories of Blenheim, Ramillies, Oudenarde, and Malplaquet. During the American Revolution, the Regiment was part of the forces that occupied New York after the Battle of Long Island in September, 1776. It fought on to the Battle of White Plains in October of that year. In 1777, the Regiment fought in Pennsylvania, playing an important part in the British victory at Brandywine. The Regiment was sent to the South in 1779, and in February of 1781 it crossed the Catawba River in the van of the British force under heavy fire. 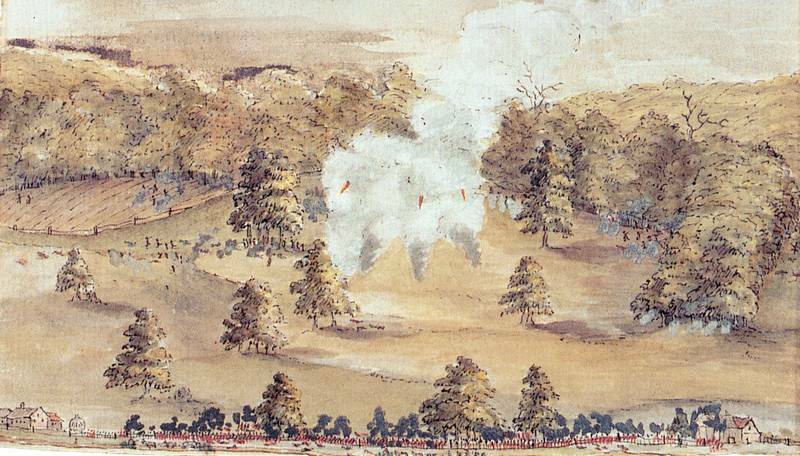 Later that year, the Regiment fought at the Battle of Guilford Courthouse in which the redcoats defeated a rebel force more than three times its size. The Guards were part of the army that was trapped and forced to surrender at Yorktown, Virginia in September of 1781. As a result of particular bravery shown at the battle of Waterloo in 1815, the Regiment became "The First Regiment or Grenadier Regiment of Foot Guards", becoming the only regiment in the British Army to have earned its title as a result of the part it played in action. Today you can see the The Grenadier Guards in London on guard duty at Buckingham Palace, or taking part in that most amazing display of precision drill, the Trooping of the Colours. "The British Empire - The First Regiment of Foot Guards" by Stephen Luscombe and Charles Griffin. A history of the First Foot Guards from its founding in 1656. "British Brigade of Guards: Royal Regiment of Foot Guards in the American Revolutionary War" by Harry Schenawolf, Revolutionary War Journal, June 8, 2013. Detailed account of the Guards in America, 1776-1783. "Preparing a British Unit for Service in America: The Brigade of Foot Guards, 1776" by William W. Burke and Linnea M. Bass, Military Collector and Historian Vol. 47, No. 1 (Spring 1995). Modifications to the Guards' London parade-ground uniforms for fighting in America. "The Organization of the British Army in the American Revolution" by Edward E. Curtis, Yale University Press, 1926. Its organization, uniforms, equipment, conditions, conduct, discipline, provisioning and transport. "A History Of The British Army, Vol. III (1763-1793)" by Hon. Sir John William Fortescue, 1899. "Recruitment of Soldiers in the British Army"
From "The Military Guide for Young Officers" by Thomas Simes, 1776, pp 205-210. "18th Century Material Culture: The British Army, His Majesty's Foot Guards", Material Culture Resource Center. 18th century paintings of Foot Guards in uniform. "British Army Uniforms from 1751 to 1783, Including the Seven Years' War and the American War of Independence" by Carl E. Franklin, Pen & Sword Books Ltd., Barnsley, U.K., 2012. An illustrated guide to uniforms, facings and lace of both the calvary and infantry. "Don Troiani's Soldiers in America, 1754-1865" by Don Troiani, Earl J. Coates and James Kochan, Stackpole Books, 1998. Illustrated guide to uniforms and arms, including paintings by Don Troiani. "The Manual Exercise as Ordered by His Majesty in the Year 1764"
British Army drill and musket handling manual. Includes a demonstration video. "The Manual Exercise as Ordered by His Majesty in 1764." British Army drill and musket handling manual. Demonstrated in this video. "A Manual of Military Exercise and Commonly Practiced Manoevres" by The 10th Regiment of Foot, 2006 (PDF). "Manual for the Safe Use of Reproduction Flintlock Weapons in Historic Weapons Demonstrations", National Park Service. Inspection and maintenance of muskets, military drill (PDF). "Untangling British Army Ranks" by Don N. Hagist. "Top 10 Facts About British Soldiers" by Don N. Hagist. "How Old Were Redcoats? Age and Experience of British Soldiers in America" by Don N. Hagist. "Eight Pence a Day: The Pay of the Private British Soldier during the War for American Independence" by Douglas R. Cubbison. "To Nourish His Majesty's Troops: The Mess, Kitchen and Provisions of the Common British Soldier During the American War for Independence" by Gregory S. Theberge. "The load a soldier generally carries during a campaign: The British Soldier's Burden in the American War for Independence" by John U. Rees. "Make use of Pack Horses as far as may be practicable: Baggage Carried on Horseback during the American War, 1776 to 1781" by John U. Rees. "The Fate of British Regulars" by Don N. Hagist. The British army pension system. 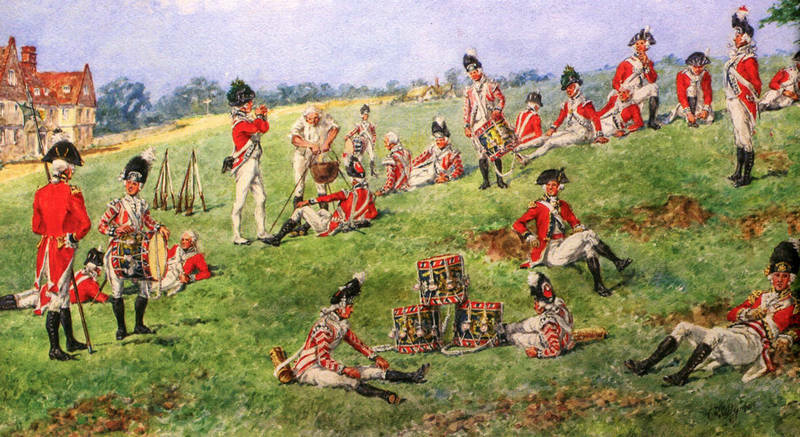 "British Battles: Battles of the War of the American Revolution 1775 to 1783", britishbattles.com. Analysis of the American Revolution battles fought by Britain and its Empire forces, illustrated and mapped. "The Philadelphia Campaign: Brandywine and the fall of Philadelphia" by Thomas J. McGuire, Stackpole Books, 2006. "Brandywine: A Military History of the Battle that Lost Philadelphia but Saved America, September 11, 1777" by Michael C. Harris, Savas Beatie LLC, 2014. "The Revolutionary War in the Southern Back Country" by James Swisher, Pelican Publishing Co., 2007. The events that led to the demise of the British campaigns in the South during the Revolutionary War. "Long, Obstinate, and Bloody: The Battle of Guilford Courthouse" by Lawrence E. Babits and Joshua B. Howard, Univ. of North Carolina Press, 2009. "Guilford Courthouse 1781: Lord Cornwallis's Ruinous Victory" by Angus Konstam, Bloomsbury Publishing, 2013. Commander of the Brigade of Guards in America from 1776 to 1780. Commander of the Brigade of Guards in America, 1780. Charles O'Hara, Revolutionary War Archives. Commander of the Brigade of Guards in America from 1780 to 1781. The Men Who Lost America by Andrew O'Shaughnessy, Yale University Press, 2013. British leadership during the American Revolution. 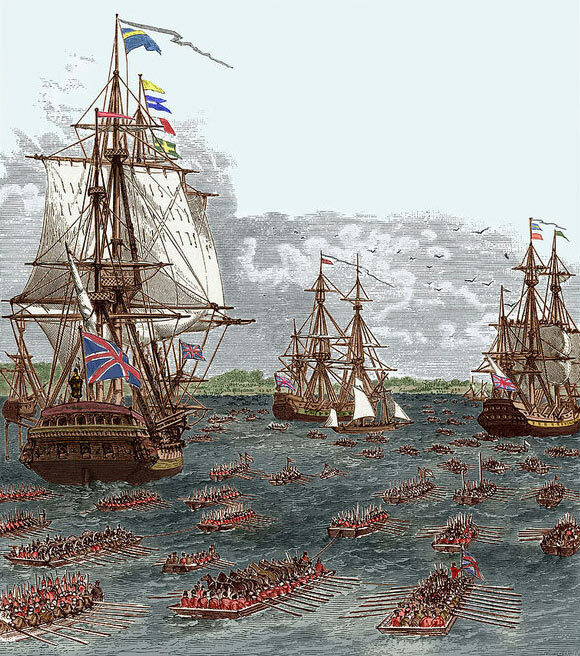 The American Revolution: A British view. The Men Who Lost America by Andrew O'Shaughnessy. British leadership during the American Revolution. National History Center lecture. George III: The Genius Of The Mad King, BBC. The character of King George III as revealed in his recently released personal papers.